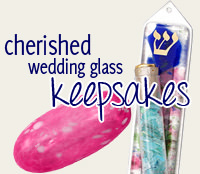 A Colorful Crushed Wedding Glass Menorah, Handmade By The Tamara Baskin Art Glass Studio Is A Beautiful Wedding Gift. Uniquely Designed With A Glass Section On The Front To Hold The Broken Glass From The Wedding Ceremony. 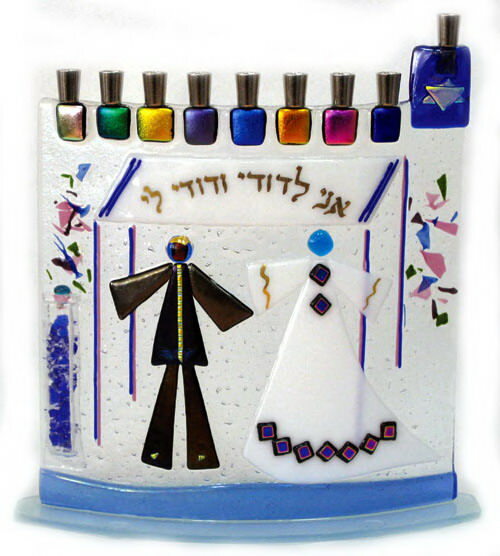 The Fused Glass Bride And Groom Are Standing Under The Chupah. With The Beautiful Hebrew Phrase "I Am My Beloved's And My Beloved Is Mine" Printed In Gold Lettering.